Our attorneys have the opportunity to acquire the skills, attitudes, and behaviors they need to be successful at Ogletree Deakins. Our programs cover traditional skills as well as those skills that have come into greater focus in a today’s changing legal landscape (collaboration, inclusion, cultural competency, self-management, and business savvy, among others). 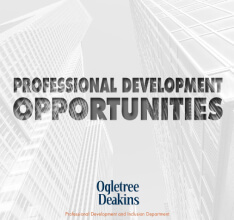 Ogletree Deakins is committed to the ongoing process of professional development including formal and informal training opportunities. These initiatives draw on internal firm resources as well as outside consultants. Participation in diversity and inclusion events expresses our commitment to these causes, and provides professional growth opportunities for Ogletree Deakins’ attorneys. 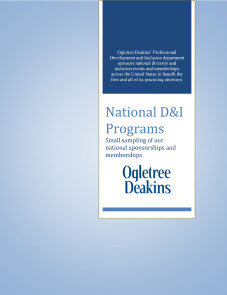 Diversity, inclusion and professional development are a strategic endeavor Ogletree Deakins takes seriously.